Neopets Puzzle Adventure is a video game that was released for the PC, Nintendo DS, and Nintendo Wii in late 2008. Whilst the PC and Wii versions have only minor interface differences, the DS version is stripped down with less features, and a different method of gaining virtual prize codes. The following guide is based off the PC version, so there will be major differences for DS players. If you would like to read the game's story, it is worth visiting the exhibit in the Neopian Museum. The game follows the exploits of a visitor to Shenkuu as they get caught up in a plot that takes them to the Lost Desert and Mystery Island, progressing through the story by completing quests for various characters. 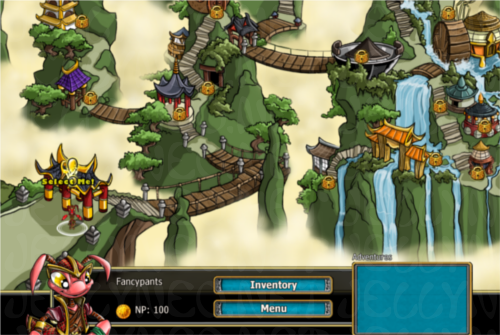 The game takes place on a world map, with players navigating using a point and click system to travel between different locations. Quests are signified by question and exclamation marks hovering above locations. They come in three types. Gold quests are story quests, and must be completed to finish the game. Silver quests are optional side quests. Purple quests are for finding hidden treasures. Upon reaching a location, just click on the highlighted area to bring up an option menu. You'll be able to select the quest you desire from there. All current quests are shown in the bottom right of the game screen, so you can keep track of what you're doing. The majority of these quests feature battles, which in Puzzle Adventure take the form of a modified Reversi game. The battle begins with a board similar to the one below (although different styles of board crop up later in the game). The game always begins with two of the player's tokens (blue) and two of the computer enemy's tokens (red) in a square at the centre of the board. In Puzzle Adventure, the player (blue) will always move first. 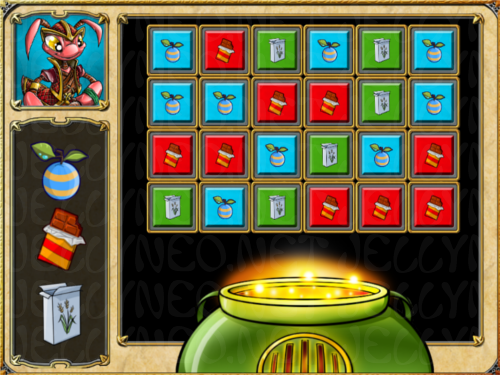 On the first turn, the player must select an empty tile in which to place a new token. However, there must be an enemy token (red) adjacent, and a friendly token (blue) on the far side of the enemy token (possible first moves are shown below). If a legal move is made, the enemy token caught in the middle is flipped and turns into a friendly token. The aim of the game is to win by either flipping all enemy tokens to friendly, or by scoring more than your opponent by the time the board is filled with tokens. Points are awarded in a variety of ways during battles, and it is here that the game begins to differ from standard games of Reversi. As a basic rule, each flipped token awards 5 points. Several tokens can be flipped at once, and if tokens are flipped in several different directions at once (horizontal, vertical, or diagonal) score multipliers are applied to the score up to a maximum of 8. In addition, battles in Puzzle Adventure feature several unique tiles which add score bonuses when tokens are placed upon them. The first of these tiles are point bonus tiles that award fixed amounts of points to the first player who places a token on them. The second type of bonus tile doesn't directly add points, but it can be a real help during the game - the Shockwave tile. This tile is randomly placed at the beginning of each new round, or whenever it is used during a round. When a token is placed on it, or a token already atop it is flipped, a randomly selected enemy tile is flipped. The best part of this is that this has the potential to cause a chain reaction of flips. This means that, if you are lucky with Shockwave tiles, it is possible to win a game in just a few moves. Keep in mind though, that all bonus tiles work both ways - your opponent will find Shockwave tiles just as useful as you! The final type of bonus tile is the Gem tile. These Gems come in three colours - Purple, Yellow, and White. These correspond to three player attributes (more on that below). Purple represents Strength, Yellow represents Movement, and White represents Defence. Whenever a token is placed or flipped on one of these Gem tiles, it will award amounts of points based on the player attributes. Though it is possible to win matches by gaining more points than your opponent by the time the board is full, it is almost always easier to win by turning all of their tokens to your colour. Purchase the Regal Skeith Staff from the weapons shop in Shenkuu as soon as you can, and equip both that and the Juma Petpet you are given in the first few quests (more on these features below). They will give you a significant advantage in battles. Go out of your way to activate shockwave tiles. Even if you can flip more tokens by going elsewhere, if you activate the shockwave, there is a chance you will flip even more tokens. If you still find yourself having difficulty, strategy guides to the game are common on the internet. Due to the similarity to Reversi, guides such as this one can give you hints about where you should move next. However, these will not allow for elements unique to this game, such as Petpets, Weapons, Shockwaves, and different board layouts. 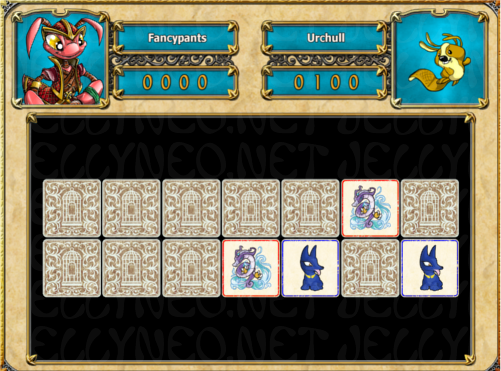 Before starting play, players must choose an ingame avatar from a selection of Neopet species and colours, and pick a name and gender for that avatar. Each Neopets species and colour combination comes with its own attributes of Strength, Movement, and Defence. As they increase, the attributes give point bonuses on the Gem tiles mentioned above. These attributes can be levelled up manually during the game, so the choice doesn't really matter. Just pick whichever species you like best and start playing! Another large part of the game is the use of Petpets. Players can have up to three of the little critters equipped at any one time, and in return they'll give bonuses when used in battle - how nice of them! There are a lot of Petpets available in the game (100 in total). Only one is awarded during the course of the story, the Juma. The rest need to either be purchased from stores or, more commonly, challenged and captured in the wild. Capturing Petpets is relatively easy. Early in the game you will be given a Web Claw item which, when equipped and used during battle with a Petpet, will cause them to be captured upon victory. After gaining the Web Claw, Petpets will begin bouncing about on the world map, it's simply a case of heading over to one and choosing to challenge it to start the battle. 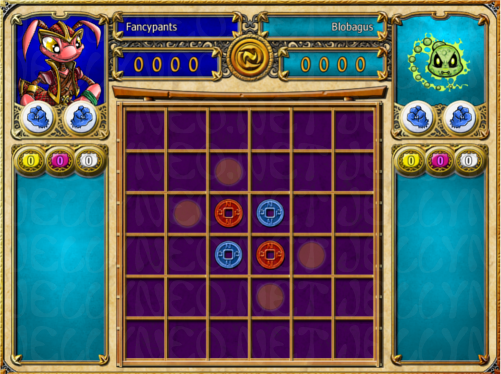 Selecting the tame option for a Petpet will launch a basic game of Kiko Match II. All you need to do is match more pairs of cards than the computer and you've got yourself a brand new Petpet to use in battle! By default, each Petpet can only be used once during battle (although they only become active after 5 rounds). However, if you chose to train up Petpets you have already tamed, you can use your Petpets several times per battle (though there will be a cooldown period of a few rounds). The training mini-game is exactly the same as the taming mini-game, only with more cards and a timer instead of a computer player. Petpets can be trained up to level 3, the maximum available. Select an empty Tile to add a Yellow Gem. Subtracts 3 from your Enemy's Purple Gem total for 5 Turns. Adds 3 to your Purple Gem total for 5 turns. Select a Yellow Gem to remove it. Select a +25 Tile to replace it with a Purple Gem (Note: Does not seem to appear in game). Select a Tile. Your Enemy must place their Token in that Tile on their next Turn. Double points from Yellow Gems for 5 Turns. Affects Enemy and Friendly alike. All Gems on the Board turn Yellow for 5 Turns. Subtracts 10 from your Enemy's Score for each White Gem they have. All Gems on the Board turn White for 5 Turns. Select a White Gem to remove it. Your Turn does not end. Select an empty Tile to add a +25 Gem. Your Turn does not end. Adds 3 to your White Gem total for 5 turns. Select a Token to remove it. Your Turn does not end. A Yellow Gem is added to a random empty Tile. Select a Purple Gem to remove it. Select a Token and Shield it for 5 Turns. Adds 25 to your Score for each White Gem you have (Note: Does not seem to appear in game). No Petpets can be used for 10 Turns. Subtracts 25% from your Enemy's Score they receive for 5 Turns. Subtracts 10 from your Enemy's Score for each Purple Gem they have. Subtracts 3 from your Enemy's White Gem total for 5 turns. Subtracts 25 from your Enemy's Score for each Yellow Gem you have. A White Gem is added to a random empty Tile. A Yellow Gem is added to a random empty Tile. Your Turn does not end. Enemy missed their next Turn. Your Turn does not end (Note: Does not seem to appear in game). Subtracts 75% from Damage you receive for 5 Turns. Select a Token to flip it. It does not cause other flips. Your Turn does not end. Select a Token and knock it out for 10 Turns. Select a Purple Gem to replace it with a White Gem. Adds 10 to your Score for each Purple Gem your Enemy has. Subtracts 50% from Damage you receive for 5 Turns. Adds 25 to your Score for each Yellow Gem your Enemy has (Note: Does not seem to appear in game). 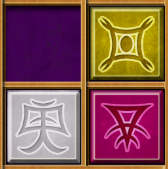 Select an empty Tile to add a Purple Gem. Your Turn does not end. Select a White Gem to remove it. Triple points from Yellow Gems for 5 Turns. Affects Enemy and Friendly alike. Select an empty Tile to add your Token, plus bonus ones above and below. Adds 50 to your Score. Subtracts 50 from your Enemy's Score. Adds 25 to your Score for each Yellow Gem you have (Note: Does not seem to appear in game). Select an empty Tile to add your Token, plus bonus ones to the left and right. Adds 10 to your Score for each Yellow Gem your Enemy has. Subtracts 3 from your Enemy's Yellow Gem total for 5 turns. Subtracts 20% from Damage you receive for 5 Turns. Adds 10 to your Score for each Yellow Gem you have. Adds 3 to your Yellow Gem total or 5 Turns. Subtracts 10 from your Enemy's Score for each Purple Gem you have. Select an empty Tile to add a White Gem. Select a +25 Gem to replace it with a Yellow Gem (Note: Does not seem to appear as a useable Petpet, only used by a single enemy in game). Select a Purple Gem to replace it with a Yellow Gem. If you find that your Petpet isn't giving you enough of a boost in battle, you can also have up to two items of equipment to give you more advantages! You'll be given a few weapons during the story, but most of the useful ones can be found in the various shops you can visit on the world map. Equipment comes in many different forms, but it can be generally grouped together into four types. Swords and Staffs which flip or place tokens. Shields which place protection over tokens for several rounds to prevent the enemy flipping them. Helmets which absorb damage taken from the abilities of your opponents. Petpet Capturing Items which allow you to capture wild Petpets. Although everyone has their favourites, I personally only find use for two items. The first, the Iceray Bracelet, is a Petpet Capturing item that serves as an upgrade to the basic Web Claw you are given during the story. The second is the Regal Skeith Staff, which allows you to flip enemy tokens twice per battle. With the Staff and the Juma Petpet, you should be able to win most battles in the game relatively easily. Increases the Bonus Score you receive from Gems by 50%. Select a Token to prevent Gem from contributing to the total for 10 Turns. Select a Token to flip it. This causes further Flips. Subtracts 50 from your Enemy's Score. Select a friendly Token to Shield it for 5 Turns. Select a Token to flip it. It does not cause other Flips. Enables Petpet Capture. Subtracts 15 from your Enemy's Score. Your Turn does not end. Select a friendly Token to Shield it for 5 Turns. Your Turn does not end. Enables Petpet Capture. Subtracts 25 from your Enemy's Score. Select a Tile to place a 3x3 grid of Shields for 3 Flips. Affects Enemy and Friendly alike. Your Turn does not end. Select a Token to remove it. There is a 50% chance your enemy misses their next Turn. Select an empty Tile to place a 3x3 grid of Tokens, replacing any Enemy Tokens. Does not cause Flips (Note: Only used by enemies). Select an empty Tile to place a 3x3 grid of Tokens, replacing any Enemy Tokens. Does not cause Flips. (Note: Does not seem to appear in game). Select a friendly Token to Shield it for 3 Turns. Vulnerable to Weapon Strikes. Enables Petpet Capture. Subtracts 15 from your Enemy's Score. Select a Tile to place a 3x3 grid of Shields for 5 Turns. Affects Enemy and Friendly Alike. Vulnerable to Weapon Strikes. (Note: Only used by enemies). Adds 1 to your Purple Gem total. Enables Petpet Capture. Your Turn does not end. Select a Tile to place a 3x3 grid of Shields for 5 Turns. Affects Enemy and Friendly Alike. vulnerable to Weapon Strikes. Your Turn does not end. (Note: Only used by enemies). Select a friendly Token to Shield it for 3 Flips. Enables Petpet Capture. Subtracts 25 from your Enemy's Score. Your turn does not end. Select a friendly Token to Shield it for 5 Flips. Vulnerable to Weapon Strikes. Your Turn does not end. Select a Token to flip it. It does not cause other Flips. Adds 50 to your Score. Enables Petpet Capture. Adds 15 to your Score. Your Turn does not end. Removes 1 from your Enemy's Yellow Gem total. Enables Petpet Capture. Adds 25 to your Score. Your Turn does not end. Select a Token to Knock Out a 3x3 grid of Tokens. Affects Enemy and Friendly alike. Select a Token to prevent Gem from contributing to the total for 15 Turns. Your Turn does not end. Adds 1 to your White Gem total. Enables Petpet Capture. Adds 10 to your Score. Subtracts 5 from your Enemy's Score. Absorbs 10% of Score damage you receive when it is 50 or more. Select a Tile to place a 3x3 grid of Shields for 5 Flips. Affects Enemy and Friendly Alike. Increases the Bonus Score you receive from Gems by 25%. Select a token to flip it. This causes further flips. Select a friendly Token to Shield it for 5 Flips. Vulnerable to Weapon Strikes. Select a Token to prevent Gem from contributing to the total for 10 Turns. Your Turn does not end. Enables Petpet Capture. Adds 10 to your Score. Subtracts 5 from your Enemy's Score. Your Turn does not end. Enables Petpet Capture. Adds 25 to your Score. Select a friendly Token to Shield it for 5 Turns. Vulnerable to Weapon Strikes. Enables Petpet Capture. Adds 50 to your Score. Subtracts 50 from your Enemy's Score. Select a friendly Token to Shield it for 5 Turns. Vulnerable to Weapon Strikes. Your Turn does not end. Select a Tile to remove a 3x3 grid of Tokens. Affects Enemy and Friendly alike. Yet another advantage you can have in battles comes from Amulets. You can only equip one Amulet at a time, and most do not appear as part of story progression. Instead, you must purchase a volume of 'Of Treasures Lost' (1-14) from a shop. When you read a copy of this book, a purple exclamation mark will appear on the world map, which marks the beginning of a treasure hunt. Following a trail of purple question marks around the world map, you must locate all the shards of a given amulet. At each dig site, you will have to play a small minigame, a variation of the Eye of the Storm game. Clicking on any tile will reveal an arrow pointing up, down, left, or right. It's just a case of following the arrows until you locate the amulet shard. You have a limited number of moves, and for later shards some blank tiles can crop up, but it isn't very difficult to locate each shard in time. Here you must play another minigame, based on Destruct-o-Match. The aim is to click connected colour blocks of two or more to raise the overall temperature. It is worth focusing on the flame icons with the black background. These blocks will raise the temperature more than the other types. I tend to find this the most difficult element of Puzzle Adventure, and it can take several tries to successfully craft an amulet. Adds 10 to your Score each Turn. Reflects 25% of damage received back to your Enemy. Subtracts 5 from your Enemy's Score for each Purple Gem you hold each Turn. Adds 5 to your Score each Turn. Subtracts 5 from your Enemy's Score for each White Gem you hold each Turn. Reflects 50% of damage received back to your Enemy. YUM YUM YUM! Used in Cooking. Delicious for your pet to nibble on. Used in Cooking. From the deepest parts of the haunted woods, the Clawmatoe is one fruit that will scratch back... Used in Cooking. Eggs, just like any other. Used in Cooking. This fruit is said to help you gain knowledge, but no one has proven it yet. Used in Cooking. An apple a day keeps the doctor away! Used in Cooking. This fruit is very similar to the banana, but it is green in colour and has a slightly bitter taste. Used in Cooking. A local delicacy in Brightvale. Used in Cooking. Ptolymelons go off very quickly when cut in half, within hours in fact. Used in Cooking. Quite how Gargarox gets the sugar coating to taste so good is a mystery. Used in Cooking. The blue bits of the Tchea fruit taste like banana, and the yellow bits taste like blueberry... Used in Cooking. A big ripe tomato - ooh, marvel at its redness. Used in Cooking. The Ummagine is a large root vegetable that grows far underground.. Used in Cooking. Once there, select three items to mix together for cooking (only certain combinations work) and away we go! Oh wait... you thought it would be that simple? Think again! You have to go through another minigame to get your hard earned food! Cooking is similar to Crafting, in that it is a Destruct-o-Match style game. The aim is to destroy blocks of similar ingredients. In order to win, you need to have 3 ingredients or less left when you run out of possible moves. Select a special Tile to remove it. Another random Special Tile is removed. Subtracts 150 from your Enemy's Score. Subtracts 50 from your Enemy for each Yellow Gem they hold. Adds 50 to your Score for each Yellow Gem you hold. Adds 1 to your Yellow Gem Count. Subtracts 50 from your Enemy's Score. Subtracts 25 from your Enemy's Score for each Yellow Gem they hold. Adds 25 to your Score for each Yellow Gem you hold. Enemy unable to use Petpets for 7 Turns. Subtracts 50 from your Enemy for each Purple Gem they hold. Adds 50 to your Score for each Purple Gem you hold. Adds 1 to battle White Gem count. Subtracts 50 from your Enemy's Score. Subtracts 25 from your Enemy's Score for each Purple Gem they hold. Adds 25 to your Score for each Purple Gem you hold. Enemy unable to use Petpets for the next 6 Turns. Subtracts 100 from your Enemy's Score. Steals 25 from your Enemy for each Yellow Gem they hold. Subtracts 100 from your Enemy's Score. Enemy misses 2 Turns. Subtracts 25 from your Enemy's Score for each White Gem they hold. Adds 25 to your Score for each White Gem you hold. Subtracts 20 from your Enemy's Score for 7 Turns. Enemy unable to use Petpets for 4 Turns. Enemy misses 2 Turns. Triples your Score received for 3 Turns. 3 Tokens are placed on random Tiles. Doubles your Score received for the next 2 Turns. Subtracts 50 from your Enemy for each White Gem they hold. Adds 50 to your Score for each White Gem you hold. Reduces Enemy Score received by 75% for 4 Turns. Adds 10 to your Score for 4 Turns. Doubles your Score received for 4 Turns. Subtracts 100 from your Enemy's Score. Adds 100 to your Score. Adds 150 to your Score. Subtracts 150 from your Enemy's Score. Absorbs all Score damage you receive for 10 Turns. Select an enemy Token. It is replaced. A Token is placed on a random Tile. Triples your Score received for 5 Turns. A friendly Token is added to a random Tile. Subtracts 100 from your Enemy's Score. Removes an additional 10 from your Enemy's Score each Turn for 10 Turns. Heads up! Code redemption for Puzzle Adventure was disabled in late 2017. Codes may no longer be entered for prizes (or the site theme), regardless of game platform. Over the course of the game, there are 10 virtual prize codes that are available. They can all be redeemed here. The Wii and PC versions of the game award the prize codes as rewards for progressing in the story (the final code is awarded just before the final battle). Each code redeemed awards certain exclusive items, including wearables and books. A complete list can be found here (please note that some of the rewards are unique to versions of the game). In addition, the 10th code will award users the Puzzle Adventure site theme. Each user can only redeem one set of codes, though it is possible to redeem a set of codes from the DS, PC, and Wii versions on one account, making three sets in total. Once a code is used, it cannot be used again. In order to generate a fresh set of codes, the game must be inserted into a different console. And that's all there is to it! Simple, eh? ;) If you ever feel the need for practice, you can do so on the main menu - but there's never any threat of losing the main game at any point - so just play away to your heart's content. You know what they say, practice makes perfect!